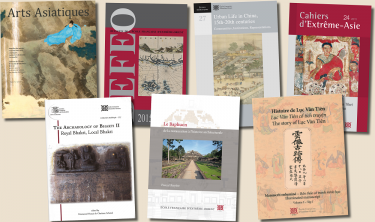 Most of the holdings in the Library of the EFEO Center in Kyoto consist of works collected by the researchers of the Hôbôgirin Institute between 1968 and 1997 - including the collections of Etienne Lamotte, Anna Seidel, and Hubert Durt. The library, containing some 6,500 volumes, is made up of works in Japanese (more than 3,000 vols. ), in English and French (3,000 vols. ), and in other Asian languages (mostly Chinese and Korean) specializing the religions of Asia - particularly Buddhism and Daoism. The collection in the ISEAS library, located in the same building, holds a further 5,000 volumes, mainly in Western languages, covering various aspects of Japanese and Chinese studies. The library of the ISEAS is open to the researchers and readers from the EFEO Center, and vice versa. From Monday to Friday, from 1:00 to 5:00 p.m.
Andrea Flores Urushima, Murielle Hladik, Inaga Shigemi, Benoît Jacquet, Matsuzaki Teruaki, Mechtild, Mertz, Oussouby Sacko, Takeyama Sey, Manuel Tardits are talking on the topic : "Wooden Architecture in Japan, Matter and Time"